Sweeping Clean | What Smells So Good? Happy Chinese New Year everyone! This cycle brings in the year of the Rabbit - so out of respect for that revered creature, I'm pleased to announce that 2011 will be a completely rabbit-free term on my blog ;-). Okay, yes, that was a bit cheeky... but in all seriousness I adore taking part (as much as I can) in all the world's cultural celebrations - I find them fascinating! At the very least, reading up on the customs and seeing how the world celebrates important events is a refreshing change to my "white-bread", suburbanite existence. Seeing as it is Chinese New Year today, I figured I'd embrace it with my take on one of the traditional customs surrounding this event. According to traditional Chinese custom, at the end of each year a common practice is to clean out all the "old" aspects of your life in order to make space for all the new good luck the coming year has in store. So it was fitting that I chose this time of year to "clean sweep" my pantry and fridge, shoving all the remnants I found into this rich, moist cake! This made use of pretty much everything that you could think of - three kinds of nuts, three types of dried fruit and even a handful of pureed berries that I found hiding in the fridge. 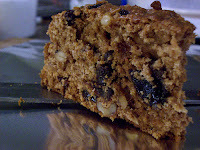 Not only was this cake a good "sweep" exercise for me in terms of cleaning house, but with all the fibre from the dried fruit, nuts and whole wheat it just might be a good "clean sweep" of a different, digestive kind too! Preheat the oven to 300F, grease a 9" springform pan. In a small bowl, mix flours, baking powder, baking soda, almond meal and pumpkin pie spice. Set aside. Add dates, raisins, prunes, cashews and walnuts. Cook just slightly (about 1 minute), stirring well. Add sugars, berry puree and fruit juice. Cook until the sugar is dissolved and the mixture is beginning to bubble vigorously. Remove from heat and cool 2 minutes, then stir in the almond milk, lemon juice and flour mixture. Pour into the prepared pan and bake 1 hour, until it tests done. That cake looks Superb! I can totally see myself having that with one of my flavored green teas ( i am a green tea maniac...hehe) . Thanks for sharing.